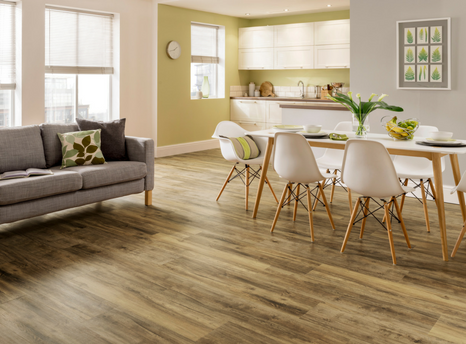 Karndean offers quality luxury vinyl flooring that has enough style and durability for any room in your home. Be sure to visit your neighborhood experts at National Carpet One in Forrest City, AR to check out everything Karndean has to offer! Karndean’s luxury vinyl flooring is referred to as Designflooring, so, as you can imagine, style and design are really what help Karndean stand out from the others. For example, most luxury vinyl manufacturers offer floors that look uniform and, to put it plainly, manufactured. The wood grains all seem to run in the same way, and the planks and tiles are not unique at all. Karndean, however, offers planks and tiles that do have individual grain patterns and appearances. In this case, Karndean floors look and feel more like real hardwoord or stone than they do luxury vinyl flooring. Furthermore, Kardean offers a variety of decorative strips and borders so that you can truly create custom designs! These strips and borders make it possible to add special features such as grouting effects. Like all luxury vinyl floors, Karndean Designflooring offers premium strength and durability. The floor is totally waterproof, so it can handle moisture and humidity. In fact, Karndean’s planks and tiles will not warp when exposed to moisture. It’s therefore possible to install Katndean floors in bathrooms, kitchens, and other rooms with moisture. At the same time, Karndean luxury vinyl will rarely chip or crack, even after drops and other impacts. Plus, if there ever is damage to a plank or tile, it can easily be replaced. Knight Tile: Knight Tile is considered Karndean's widest and most versatile selection. There are a variety of wood and stone looks, and you can choose from planks and tiles. Knight Tile planks and tiles have a 2 mm total thickness, and they have a 12mil wear layer to handle scratches and scuffs. The planks and tiles feature a smooth surface. Learn more about the Knight Tile collection. Art Select: If you're looking for premium style and design, the Art Select collection may be your best option. Art Select floors are inspired by nature, and they feature some of the most authentic wood and stone looks on the market. The wood styles include Handcrafted, Oak Royale, Oak Premier, Maple, and Parquiet. The stone styles include Slate, Limestone, Travertine, and Marble. Learn more about the Art Select collection.